The name salamander probably brings to the average mind one of two thoughts; either a slimy, creeping creature, very repugnant and to be avoided, or stories of fire-loving amphibians that emerge from the flames very unexpectedly. Those who are interested in. the confusion brought about by common names know that the name salamander has been used rather freely, even being applied to certain mammals (gophers or moles) in some of the southern states. Salamanders have for the most part a very smooth and moist or “slimy” skin. They are amphibians and many species spend a portion of their life in water (larval stage), but when mature they usually leave the water and live on land but not on dry land. Their body processes are dependent upon a certain amount of moisture, so their skin must always remain moist or slimy; and for that reason they are to be found only in moist or damp habitats, under rocks, near streams or ponds, in dead or decaying logs, in caves or crevices in the rocks. Furthermore, some species of salamanders are known to give off a slimy secretion, especially when handled or irritated. This secretion may be slightly poisonous or distasteful to certain of their enemies, but it does not ordinarily affect man unless it reaches delicate membranes such as in the eyes. The association of salamanders with fire is not without some significance, for undoubtedly many of the pioneers, in addition to the ancients, were occasionally struck with awe to see salamanders crawl from burning logs in the fire place. These observers were not aware that certain salamanders live under the bark of rotten logs, or within the moist center of the rotten log itself. Probably the salamander was just as surprised as his human observer to find himself suddenly subjected to a rapid increase in body temperature, and perhaps his only thought was to depart from his improperly selected abode and to locate a more moist and cool situation for a retreat. It is unfortunate that so many people have developed a fear of salamanders. Many seem to have only the one desire—that is, to “kill the slimy creature.” All salamanders are harmless as far as human beings are concerned. Moreover, they are of considerable economic value because of the large numbers of insects, spiders, and larvae that they destroy in securing their food. They are worthy of some protection. On the other hand it is fortunate for the salamanders that so few are ever seen by man. Their habit of retreating to the moist or damp situations, under rocks, logs, or in caves or crevices, seems to give them a certain degree of security. Few people, except experienced collectors are aware of the fact that fairly large numbers of salamanders are present in many localities. They are sometimes found where conditions appear rather unfavorable. Another reason salamanders are seldom seen by the average person is because twice each year certain forms are forced to retreat from the surface due to seasonal change. Some hibernate, disappearing from the surface with the beginning of cold weather. These may burrow down into the soil or retreat downward in cracks in rocks or logs to a point where they avoid freezing temperatures. Others retreat in a similar fashion during the late summer and early fall months, especially in regions where there is a long dry or extremely warm period. This summer retreat is called aestivation, and it carries them over until the fall rains make it possible for them to move around freely when moisture is again abundant for their sensitive thin skins. Only three species of salamanders have thus far been collected from within the boundaries of Yosemite National Park, although at least two others approach quite closely and may someday be taken within the Park. The great divergence in adaptations and habitats of the three forms found in this area is most interesting. Only one possesses lungs, the other two are without normal lungs. Only one lays its eggs in water. There they hatch and the young pass through a larval stage with feathery gills, a stage requiring several months. One spends most of its time under or inside moist, damp and rotten logs, and never even goes to water to deposit its eggs. Although not definitely known, it is believed that the eggs are laid singly or in clusters and attached to the underside of old damp logs. There the young pass entirely through their larval stage within the egg and emerge as fully developed but immature young. This form seems peculiar in not possessing lungs, although it lives entirely on land. The third species is even more strange than the other two for it lives far from either water or logs, usually under flat rocks where there is damp soil, yet it possesses no lungs. There is a possibility that this form does not lay eggs and that the young are brought forth alive, fully developed, but small and immature. A brief description of each of these salamanders is given in the following paragraphs; however, those who are particularly interested should read some of the references listed at the end of this publication. The Sierra newt, often commonly called water dog or mud puppy, is probably the most common salamander found in Yosemite National Park. This is due largely to the fact that this salamander returns to the water each year to lay its eggs and causes the individuals to become fairly abundant in the vicinity of good water holes or ponds. When the young hatch they are typical larvae with feathery gills. They must remain in the water a year or so before they develop to the point where they can leave the water and live on land. The Sierra newt is about seven inches in length when full grown; however, the tail accounts for about half of this length. The color of the back and sides is a chocolate-brown to burnt umber, sometimes very dark, but the underside is in sharp contrast, being either burnt orange or in some instances a shade of light red. This species is never spotted and is easily distinguished from the other salamanders in this area. This species and some of its close relatives are quite unique among the salamanders since the skin of individuals living on land away from water actually becomes rough, due to the development of many tiny wart-like tubercles, but when they return to the water for depositing eggs, the skin again becomes smooth and slimy. Laurel Lake, and in the Miguel Meadows. This may not be a true index of distribution but rather a result of conditions favorable for collecting. The Sierra Nevada salamander is the only spotted salamander found within the boundaries of Yosemite National Park. The general body color is blackish or deep brown on the back and sides, but with many large and small irregular spots or blotches of dull orange to orange yellow. The underside of the body is a fairly uniform pale slate fading to gray on the tail. The adults average about five inches in length. These salamanders are interesting due to the fact that, although they seldom go near pools of water but live entirely on land, they have no lungs. Furthermore, they do not deposit their eggs in water, but presumably lay them singly or in small clusters which are attached to the underside of damp or rotten logs and bark. If like a closely related species the females will sometimes remain and either stand guard or actually curl their tails around the cluster, perhaps to aid in keeping the eggs moist by means of glandular secretions. Some observers believe that the eggs are well advanced in development before they are deposited. The young do not spend a larval stage in water, but pass through this entire stage within the egg and emerge as fully developed but immature forms. It seems a bit strange that this salamander, which never spends any portion of its life in water, should have such a very fine, delicate, smooth and slimy skill. But when it sacrificed its lungs it became necessary that it do a certain portion of its breathing through the skin. It must always stay where sufficient moisture is available to keep its skin moist. These forms are usually found under the damp and moist bark of old rotten or decayed logs, beneath the logs themselves, or occasionally in cavaties within the rotting logs. to readily release its tail when attacked by an enemy. The enlarged portion of the tail contains poison glands which secrete a fluid that probably serves to protect these salamanders to a certain degree. Although nowhere abundant, these salamanders appear to be widespread over the Park below 7500 feet. They have been taken on the floor of the Valley, above Inspiration Point, at Wawona, in the Mariposa Grove, in Miguel Meadows, and in the Hetch Hetchy Valley. Of all the forms of vertebrate life found in Yosemite National Park, probably no other is so well known to the scientific world, yet so little known to the average Park visitor, as this very strange species of salamander. It was not known to scientists until 1915 when the first two specimens were accidentally caught in a mouse trap at a camp near the base of Mount Lyell. It was nearly twenty years later before anyone learned of its abundance within the Park. Even today there is still much to be learned of its life history. and flattened, and there is considerable webbing between the toes. The Mount Lyell salamander differs from the more common salamanders by not possessing lungs, and in being able to live far from ponds or water. It is presumed, that like a European relative, it does not deposit eggs, but rather the young are born alive. Its isolation along the west slope of the Sierra Nevada mountains is indeed significant, for its nearest relatives are found—not in the New World—but in Italy and France of the Old World. 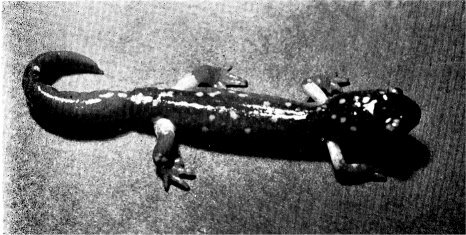 During the past few years this salamander has been taken at widely separated localities in Yosemite National Park; however, most of the specimens came from above 7000 feet in elevation. Due to the fact that they are in no way dependent on running water, pools, or fallen and decaying logs, but are found under flat rocks that are resting on soil kept wet by seepage water, many times by melting snow water, they are found in such unexpected places as on the very top of Half Dome. A regular “colony” make their home under the flat rocks in the little valley on top of Half Dome, where the snow field lasts well into July, and where they are kept moist by the cold snow water seeping along in the soil beneath the flat rocks. More Mount Lyell salamanders have been collected from the top of Half Dome than from any other simile locality in Yosemite National Park.